Analyze heat transfer by conduction, convection, and radiation with the Heat Transfer Module, an add-on product to the COMSOL Multiphysics® platform. 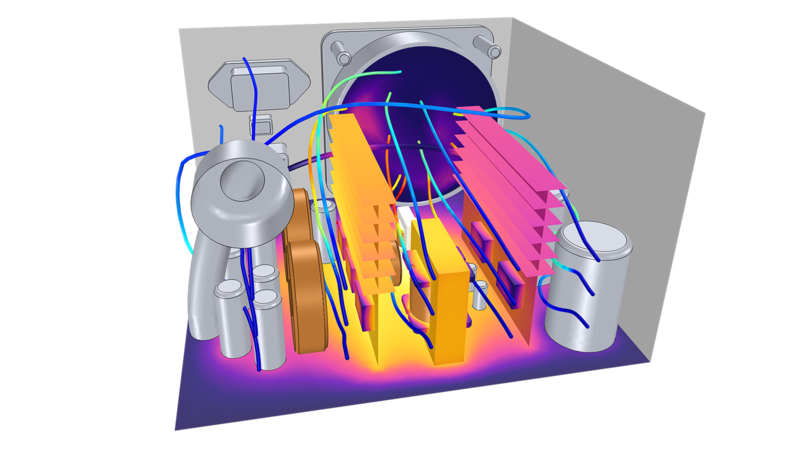 The Heat Transfer Module includes a comprehensive set of features for investigating thermal designs and effects of heat loads. You can model the temperature fields and heat fluxes throughout devices, components, and buildings. To examine the real-world behavior of a system or design virtually, easily couple multiple physical effects in one simulation with the multiphysics modeling capabilities included in the software. The Heat Transfer Module contains features for modeling conjugate heat transfer and nonisothermal flow effects. These capabilities can be used to model heat exchangers, electronics cooling, and energy savings, to name a few examples. Both laminar and turbulent flow are supported and can be modeled with natural and forced convection. It is possible to account for the influence of pressure work and viscous dissipation on temperature distribution. Turbulence can be modeled using Reynolds-averaged Navier-Stokes (RANS) models such as the k-ε, low-Reynolds k-ε, algebraic yPlus, or LVEL turbulence models. 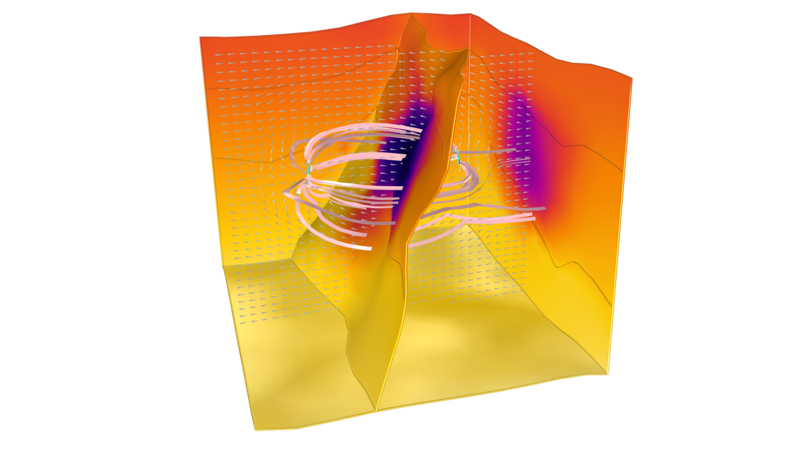 The realizable k-ε, k-ω, shear stress transport (SST), v2-f, and Spalart-Allmaras turbulence models are available when combined with the CFD Module. The temperature transition at the fluid-solid interface is automatically handled using continuity, wall functions, or automatic wall treatment, depending on the flow model. Natural convection can be easily accounted for by activating the Gravity feature. Model of two separated fluids at different temperatures flowing through a shell-and-tube heat exchanger. 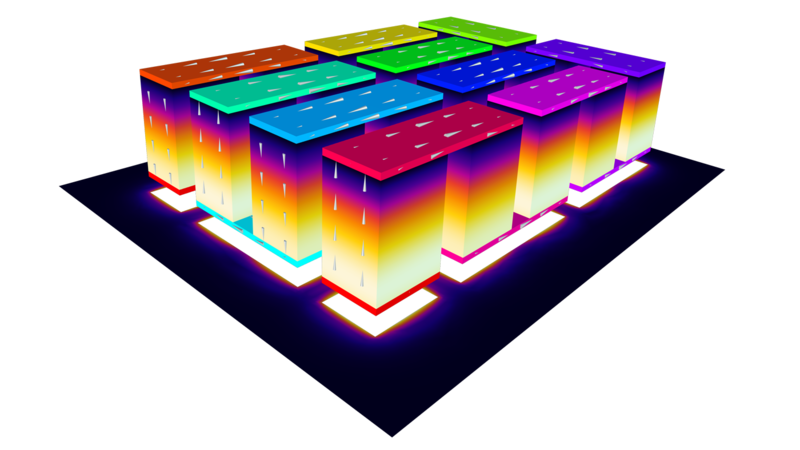 For modeling heat transfer in thin layers, the Heat Transfer Module provides specialized layer models and layered material technology to easily define complex configurations and investigate heat transfer in layers that are geometrically much smaller than the rest of a model. This functionality is available for thin layers, shells, thin films, and fractures. For individual layers, the thermally thin layer model is used for highly conductive materials in situations where the layer contribution to the heat transfer is primarily in its tangential directions and where the temperature difference between the layer sides is negligible. Conversely, the thermally thick layer model can represent poorly conducting materials that act as a thermal resistance in the shell's perpendicular direction. This model computes the temperature difference between the two layer sides. Finally, the general model provides a highly accurate and universal model, as it embeds the complete heat equations. Layered material features support similar heat loads to the regular domain model. In particular, heat sources and sinks can be defined on layers or at layer interfaces, and heat flux and surface-to-surface radiation can be defined on both sides of the shells. When employing the layered material technology, there are preprocessing tools for detailed layered material definition, load/save of layered structure configurations from/to a file, and layer preview features. Additionally, tools are included to visualize results in thin, layered structures as if they were originally modeled as 3D solids; specifically, surface plots, slice plots, and through thickness plot are supported. The layered material functionality is included in the AC/DC Module and the Structural Mechanics Module, making it possible to include multiphysics couplings like electromagnetic heating or thermal expansion on layered materials. The Heat Transfer Module uses the radiosity method to model surface-to-surface radiation on diffuse surfaces, mixed diffuse-specular surfaces, and semitransparent layers. These are available in 2D and 3D geometries, and in 2D axisymmetric geometries when modeling diffuse surfaces. The surface properties may depend on temperature, radiation wavelength, or any other quantity in the model. Transparency properties can also be defined per spectral band (and an arbitrary number of spectral bands is supported). Predefined settings are available for solar and ambient radiation, where the surface absorptivity for short wavelengths (the solar spectral band) may differ from the surface emissivity for the longer wavelengths (the ambient spectral band). In addition, the sun radiation direction can be defined from the geographical position and time. The view factors are computed using the hemicube, the ray-shooting, or direct integration area method. 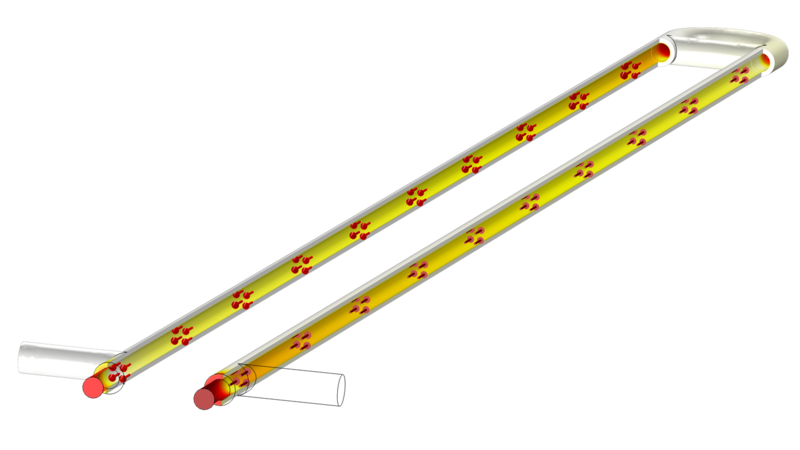 For computationally effective simulations, it is possible to define planes or sectors of symmetry. When combined with a moving frame, the surface-to-surface radiation interface automatically updates the view factors as the geometrical configuration deforms. Easily account for phase change disruptions in heat transfer analyses with the Heat Transfer Module. The Phase Change Material node implements the apparent heat capacity formulation to account for phase change. It accounts for enthalpy of phase change and changes in material properties, including the ability to model volume changes using moving meshes. 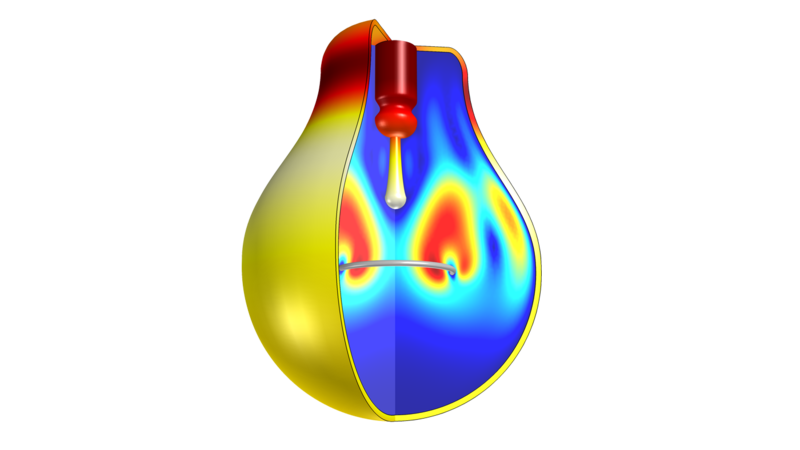 The Application Library in the COMSOL® software contains tutorial models that use a Deformed Geometry interface and the Stefan energy balance condition to compute the velocity of the front between two phases. 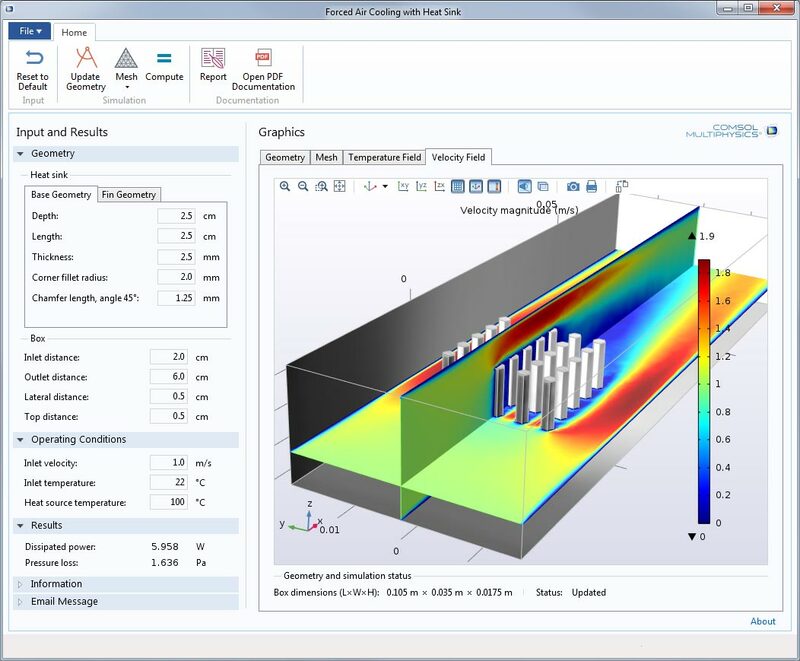 The Heat Transfer Module can be used to study the three types of heat transfer in detail, expanding the analyses that are possible with the core COMSOL Multiphysics® simulation platform. To describe conduction that occurs in any material, you can define the thermal conductivity as isotropic or anisotropic, and it may be constant or a function of temperature (or any other model variable). Account for the motion of fluids in heat transfer simulations. You can use features for modeling pressure work; viscous dissipation; as well as forced and free (or natural) convection. 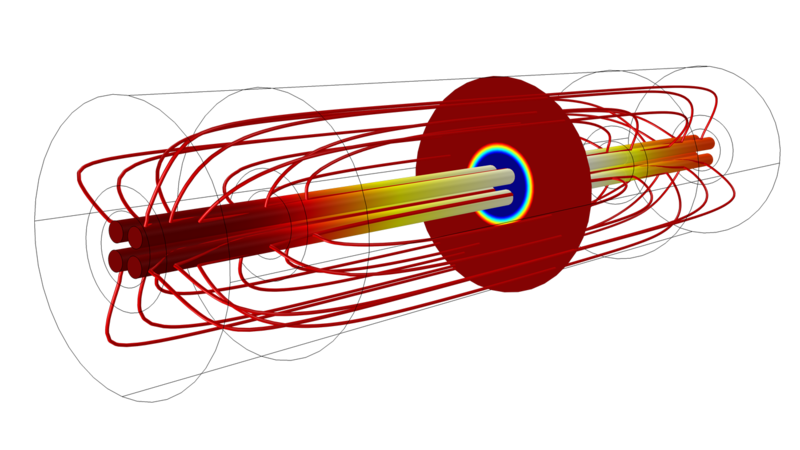 Natural convection is automatically modeled when the gravity option is selected in the Single-Phase Flow interface. The Heat Transfer Module enables you to model surface-to-surface radiation using the radiosity method as well as radiation in participating media using the Rosseland approximation, P1 approximation or discrete ordinate method (DOM). The P1 approximation and DOM are also available for radiation in absorbing and scattering media, to model light diffusion in a nonemitting medium, for example. You can also model a radiative beam in absorbing media radiation using the Beer-Lambert law and couple the effect with other forms of heat transfer. A model of free convection in a light bulb that also accounts for conduction and radiation. Whether heat transfer is the primary area of focus or part of a larger, complex analysis, you most likely need to examine multiple physical effects at once. With the multiphysics modeling capabilities of the COMSOL® software, you are able to perform complete and thorough analyses in one simulation environment, following a consistent workflow across physics. 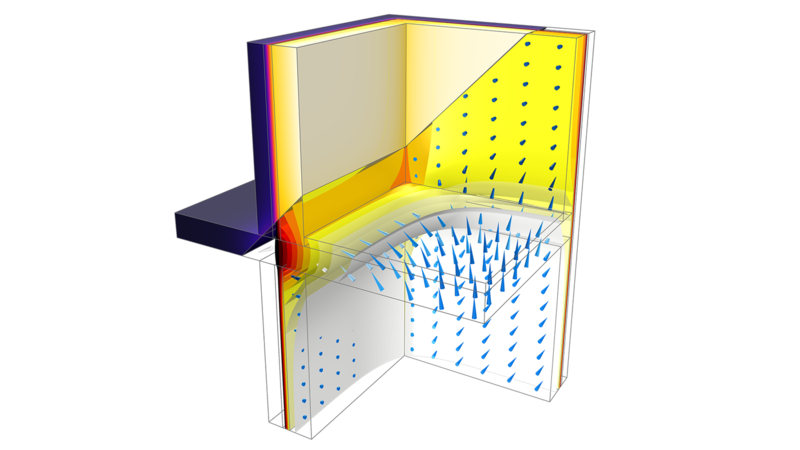 This intuitive approach to modeling and simulation can be used to account for heat transfer and all of the physical phenomena involved in your application. Browse the following applications to see a small sample of what you can analyze and simulate with COMSOL Multiphysics® and the Heat Transfer Module. Model electromagnetic heating at different electromagnetic regimes using an electromagnetics and heat transfer coupling. The Heat Transfer Module can be used to analyze the effects of Joule heating, inductive heating, and microwave heating effects. These multiphysics simulation capabilities are useful in the design and study of underground cables, fuses, inductors, and a wide variety of additional applications. 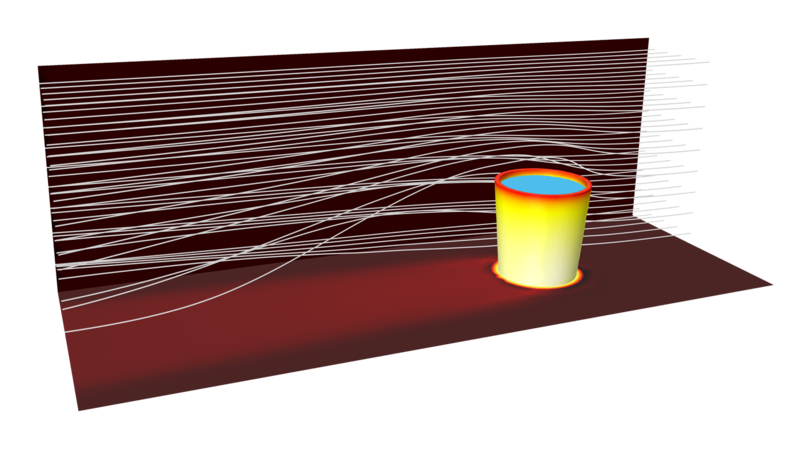 You can benefit from advanced capabilities for modeling electromagnetic heating by combining the Heat Transfer Module with the AC/DC Module, RF Module, Ray Optics Module, or Wave Optics Module. A magnetic field (circular slice), produced from current passing through a coil, causes a temperature rise in the four pipes in this inline induction heater model. The Heat Transfer Module has robust interfaces for modeling heat transfer in porous media, accounting for both conduction and convection in solid and open pore phases of the porous matrix. You can select different averaging models to define effective heat transfer properties that are automatically calculated from the respective properties of the solid and fluid materials. You can also access a predefined feature for heat dispersion in porous media, caused by the tortuous path taken by fluids through the pores. Combine the Heat Transfer Module with the CFD Module and Subsurface Flow Module to solve for porous media flow (Darcy's law and Brinkman's extension to Darcy's law) and couple it with the heat transfer model. To model local thermal non-equilibrium, you can use the LTNE interface. It implements separate equations for the fluid and the porous matrix temperature fields with a coupling to account for the heat transfer at the fluid-solid interface in pores. Model of heat transfer in porous media as water flows through a fracture in a geothermal doublet. Thermal expansion is very common and can lead to very high levels of thermal stress. Thermal stress can be positive, such as for shrink fit and bimetallic temperature sensor applications, but it can also be negative. For example, it can negatively affect buildings, thus causing a need for expansion joints, as well as devices subject to high temperature ranges and cyclic thermal loads. A good thermal design is the key to optimizing the effect of thermal expansion, either by minimizing or maximizing the effect depending on the case. This phenomenon can be accounted for and studied using the multiphysics coupling functionality in the Heat Transfer Module. When used in conjunction with the Structural Mechanics Module, the Heat Transfer Module increases the capabilities for analyzing the thermal stress in a device, component, or system; for example, to account for conjugate heat transfer or heat transfer in thin shells. There are models available for the contact thermal conductance coefficient, which is dependent on the contact pressure. You can also account for the surface-to-surface radiation contribution between surfaces separated by small gaps. The contact pressure and gap distance are obtained from the structural mechanics model. A plot of the temperature distribution inducing thermal stress in a turbine stator blade. You can model thermoelectric effects by coupling physics interfaces for electric currents and heat transfer in solids, and easily account for the Peltier-Seebeck-Thomson effects. Set the material properties of a model from a selection of predefined thermoelectric materials, such as bismuth telluride and lead telluride. As always, you can also define the material properties yourself or combine the AC/DC Module with the Heat Transfer Module for advanced modeling features for electric currents. A thermoelectric cooler device. The temperature distribution is plotted in the thermoelectric legs with cones to indicate the flow of electric current throughout the device. For work involving the design of electronic devices, components such as electronic chips, or power systems, the Heat Transfer Module has the functionality to analyze cooling capacity. Simulate conduction and convection in these applications to ensure optimal performance and operation. 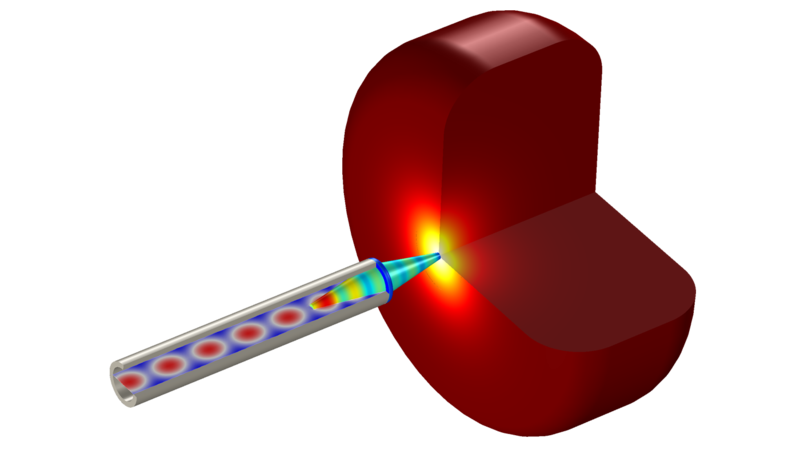 You can also model the cooling of heat pipe designs for use in microelectronics or computers. While analyzing electronic cooling, an efficient and accurate simulation is important to avoid malfunction and suboptimal designs. The Heat Transfer Module is both computationally efficient and accurate for computing the cooling capacity. With the heat sink parts included in the software, you can easily set up complex geometries. The thermal behavior of a power supply unit for a computer. The model computes the forced convection cooling of the device, whose enclosure is ventilated by an air stream entering through a grille and being extracted by a fan. Heat exchangers are involved in a variety of application areas, such as water treatment, resource refinery, nuclear power, food and beverage production, refrigeration, and more. Heat exchanger analysis involves a combination of heat transfer in fluids and solids. The fluid carries energy over large distances, while the solids separate the fluids so that they can exchange energy without mixing. You can account for this behavior with the available physics interfaces in the COMSOL Multiphysics® software and even model forced convection or phase change within these devices. A crossflow heat exchanger showing the fluid flow velocity (surface plots) as well as the temperature distribution (isosurfaces) as the fluids exchange energy. A heat exchanger showing the fluid flow velocity (arrows) as well as the temperature distribution (isosurfaces and streamlines) as the fluids exchange energy. A double pipe heat exchanger showing the velocity field in the inner pipe (arrows) and the temperature distribution in the outer pipe (surfaces) as the fluids exchange energy. 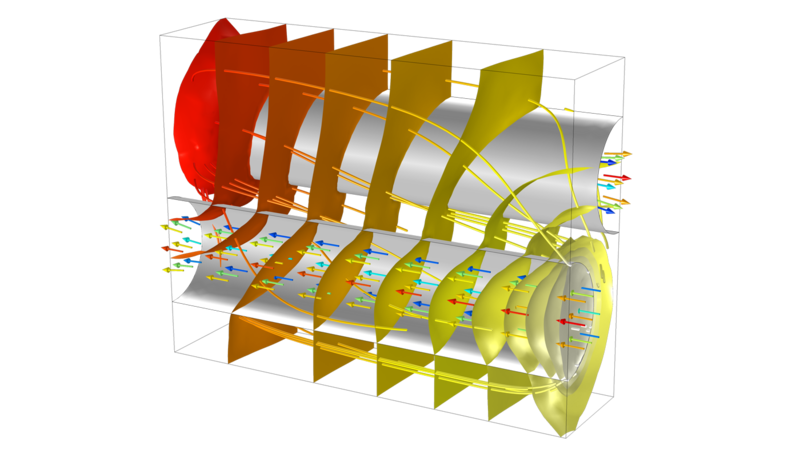 A finned-pipe heat exchanger showing the fluid flow (cones) as well as the temperature distribution (surfaces) as the fluids exchange energy. Thermal management is vital to the design of buildings, as building designers need to consider heat and moisture variations in building components. You can use the Heat Transfer Module to analyze thermal management in wooden frames, window frames, porous building materials, and other building components. Additionally, there are tools that can be used to analyze water condensation and evaporation on building surfaces. In the Heat Transfer Module, there are specialized features for analyzing heat and moisture storage, latent heat effects, as well as diffusion and convective transport of moisture. Simulate convection and diffusion, as well as eddy-based turbulent mixing for heat and moisture transport in air. The temperature distribution (surfaces and isosurfaces) and the heat flux (arrows) throughout a building structure with separating two floors from an external environment. You can analyze processes in medical applications — such as tumor ablation, skin probes, and tissue necrosis — with heat transfer modeling. Specific functionality in the Heat Transfer Module can be used to simulate thermal effects in human tissue. The COMSOL® software solves for the bioheat equation and can account for thermal effects in tissues via the blood properties, blood perfusion rate, and the metabolic heat sources. Effects of microwave heating, resistive heating, radiative heating, and heating through chemical reactions can easily be included in the analysis. A conical dielectric probe used for skin cancer diagnosis is analyzed for radiation characteristics and temperature variations of the skin tissue. Evaporative cooling is a process involved in drying; evaporation; and even application areas like building physics and food processing. The Heat Transfer Module includes settings for modeling moisture transport in air coupled with nonisothermal flow to study these effects. The physics interfaces determine saturation pressure and can account for evaporation on surfaces during the evaporative cooling process, which models the effect of the heat of evaporation on the temperature. A glass of hot water exposed to a dry air stream at room temperature is modeled to analyze the evaporative cooling process. Think of the time and energy you would be able to devote to new projects if you did not have to run repetitious simulation tests for other people on your team. With the Application Builder, built into COMSOL Multiphysics®, you can build simulation applications that further simplify the simulation workflow by enabling you to restrict the inputs and control the outputs of a model so that your colleagues can run their own analyses. With applications, you can easily change a design parameter — such as heat rate, operating conditions, or material or geometrical properties — and test it as many times as you need without having to rebuild the entire simulation. You can use applications to run your own tests more quickly or distribute applications to other members of your team to run their own tests, further freeing up your time and resources for other projects. Test different heat sink configurations with an app. Change the base geometry, fin geometry, box dimensions, and operating conditions; inspect the temperature and velocity fields; and monitor the dissipated power and pressure loss with numerical results.